Republicans have a great record at ignoring threats to our national security. They opposed Clinton’s actions against al Qaeda when he was President. When Bush took office, his administration ignored the plans passed on from the Clinton administration, not believing that a non-govenment group could pose a serious threat. Bush ignored warnings, including the daily intelligence brief, warning of an attack, presumably because he didn’t want to interupt his vacation and risk not making the Guinsess Book of World Records for head of state spending the most time goofing off. We now have a threat which is potentially even more dangerous than al Qaeda, but the Republicans again choose to stick their heads in the sand and ignore it. Stepping into the middle of a partisan debate on Capitol Hill, the United States’ top intelligence official has endorsed a comprehensive study by spy agencies about the impact of global warming on national security. A provision requiring a national intelligence estimate on climate change was in the 2008 intelligence authorization bill that the House passed early Friday morning. The exact amount of the authorization is classified, but it is believed to be approximately $48 billion, which would be the largest intelligence authorization ever considered by Congress. Republicans had tried to defeat the provision on the national intelligence estimate, saying that intelligence resources were too precious to be used to study the impact of climate change. “Let other federal agencies, as more than a dozen already do, cover the ‘bugs and bunnies.’ But let our spies be spies,” Representative Peter Hoekstra of Michigan, the ranking Republican on the House Intelligence Committee, wrote Thursday in a Wall Street Journal op-ed article. But intelligence officials have already recognized the importance of studying how crises caused by climate change, like famine and rising sea levels, could affect the United States’ security. Even as Congress was debating whether to order a national intelligence estimate, intelligence agencies had already planned to include a discussion of global warming in a report next year on the main security challenges facing the United States through 2025. The proposed national intelligence estimate would project the impact of global warming over the next three decades, examining political, social, economic and agricultural risks. In his letter to the House Intelligence Committee, Mr. McConnell said that intelligence analysts would not do primary scientific research about climate change, but would instead rely on analyses by other government agencies for global warming projections. Last month, a report written by several retired generals and admirals concluded that climate changes posed a “serious threat to America’s national security,” and could further weaken already unstable governments in developing countries. 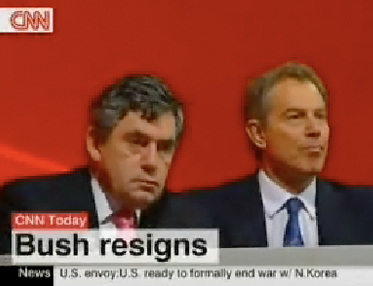 CNN International mixed up Bush and Blair’s names for twelve seconds and gave a much better headline. (Hat tip to TVNewser for the screen grab).